Let's be frank, climate change is real. We, as a country, have to do more to fight climate change. That being said climate change is a red herring in this discussion. Why? Because up to 80 per cent of the emissions associated with fossil fuels are generated in their combustion. Pipelines represent a negligible part of that equation. I am here today not to speak directly in support of the TMX but rather to clear up some misconceptions and talking points you have heard, and will hear, at this open house. Let's start with the elephant in the room: climate change. Let's be frank, climate change is real, it is dangerous and we, as a country, have to do more to fight climate change. That being said climate change is a red herring in this discussion. Why? Because up to 80 per cent of the emissions associated with fossil fuels are generated in their combustion. Pipelines represent a negligible part of that equation and the upstream numbers for Canadian producers are entirely comparable to our American counterparts. Carbon emissions are the result of the demand side of the ledger, the burning of fossil fuels, not their generation/transportation. The world is awash in oil. If it is not supplied from Alberta, it will be supplied by Algeria or Nigeria. If you want to fight climate change, don't fight pipelines -- fight for market-based mechanisms like carbon pricing. History has shown that the only way to reduce fossil fuel use (and resultant carbon emissions) is to address the demand side of the ledger. So, where is the demand coming from? Well almost all (95 per cent) of the world's transportation energy comes from petroleum-based fuels. Transportation use represents about 33 per cent of energy use in British Columbia. Only by making fossil fuels more expensive will we have the incentive to develop the technologies necessary to get our transportation systems off fossil fuels. Alternatives to fossil fuels do not exist for our planes, trains, ferries and transport trucks and electrical vehicles for personal transportation are just becoming practical. Even with a herculean effort we are not going to eliminate fossil fuels from our transportation system for decades. Only by making fossil fuels more expensive will we have the incentive to develop the technologies necessary to get our transportation systems off fossil fuels. Moreover, even if we were to somehow convert our transportation systems to electric power, we would not come close to having the electrical generating capacity needed to meet the demand. In British Columbia transportation uses the equivalent of nine to 15 Site C Dams worth of energy per year. We do not have that kind of electricity oversupply just lying around. Renewables will certainly help but ramping up our renewable energy capacity represents another multi-decade long struggle and our existing electrical grid is not compatible with large-scale renewable energy. Going to renewables will mean completely re-designing our electrical grid which will also take time and money. What this means is that we are going to have a continuing demand for fossil fuels for decades. The question we have to ask ourselves is how are we going to get access to that fuel? In most of B.C. we get our liquid fuels from Alberta (by truck, rail and pipeline) and the Puget Sound (by barge and tanker). That supply network is stretched extremely thin and as the folks in the interior know, a short shut-down in Edmonton can mean empty gas stations in Kamloops and Kelowna. I want to leave my kids a world where fossil fuels are not used for transportation or energy, but we are not there yet. The Puget Sound has historically received the majority of its crude oil from Alaska via tanker. You know that West Coast Tanker ban? Well, Americans have been shipping up to 600,000 barrel/day of crude from Alaska to the Puget Sound through the Salish Sea for the last 20 years. That Alaskan oil is drying up, and besides Canadian oil (via the existing Trans Mountain) the Puget Sound is going to be getting its future oil by rail. How will they do that? Well the infrastructure is almost in place to supply up to 725,000 barrels/day to the U.S. West Coast by rail. 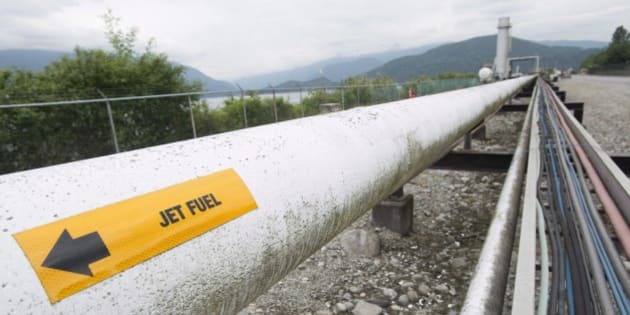 Much of that oil will travel along the headwaters of the Kootenay River and alongside the Columbia River to the Puget Sound. So today's discussion is not about climate change nor is it about renewable energy, it is about how we are going to get liquid hydrocarbons to market in the decades it takes to wean ourselves off fossil fuels. The only debate, today, is how do we transport that oil as safely as possible? Well, the answer to that question is definitive: pipelines. Pipelines have 4.5 times fewer accidents/spills than oil-by-rail and while every oil spills represents a catastrophe; spills from pipelines do not hold a candle to the apocalyptic aftermath of rail accidents. People like me can clean up the Kalamazoo River, but we can't do anything to restore all those lives lost in Lac Megantic. I am a pragmatist. I want to leave my kids a world where fossil fuels are not used for transportation or energy, but we are not there yet. Until we reach that point, we will need to move fossil fuels, and the safest and most environmentally sensitive way to move those fuels over land is via pipeline and not oil-by-rail. Because let's be honest, here: the alternative to TMX is not some fossil fuel-free Shangri-La, it is oil-by-rail.